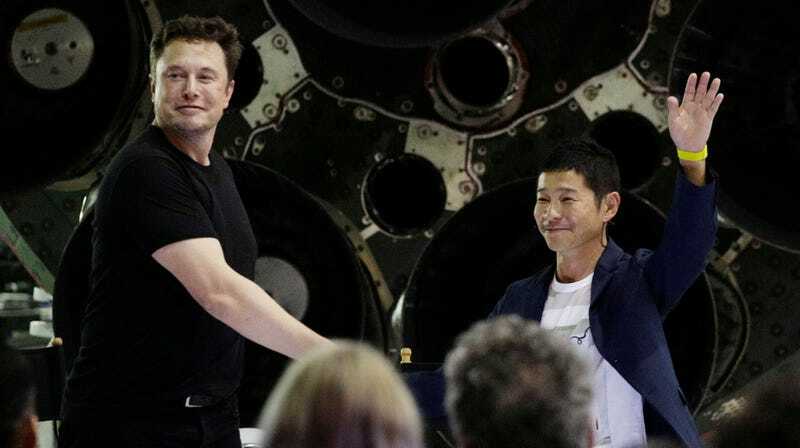 Elon Musk and Yusaku Maezawa at a SpaceX event on Monday. SpaceX CEO Elon Musk announced the first paying tourist that the company plans to fly around the moon on a 240,000-mile journey on its promised Big Falcon Rocket (BFR)—and it’s Japanese billionaire, founder of online fashion giant Zozo, and art collector Yusaku Maezawa. Per the Verge, Musk also showed off another revision to the BFR, stating that the new design would have seven instead of six large Raptor engines, boast additional cargo room on the rocket’s bottom, and have three instead of two rear fins as well as front actuator fins. Musk has loudly touted the potential for the BFR to lead interplanetary colonization efforts; the Verge wrote Musk said the updated design is a roughly 387-foot-long (118 meter) two-stage vessel capable of carrying 100 metric tons of cargo to a theoretical future Mars colony if refueled in orbit. According to the New York Times, Maezawa “may be best known” for his $110 million purchase of a 1982 Jean-Michel Basquiat painting of a skull, a sum that his sister Lisane Basquiat referred to as leaving the family “speechless.” Maezawa explained his intent to bring along five to eight artists on the trip, the paper added, as part of a project to create art in space named Dear Moon. Musk said SpaceX would conduct several uncrewed test launches of the BFR. The moon trip would last four to five days, he said. After launch, the BFR will make several course corrections and complete one loop around the moon before returning to Earth, where it will land upright, in a maneuver SpaceX has pioneered with its Falcon 9 rockets. “This will look really epic in person,” Musk said.